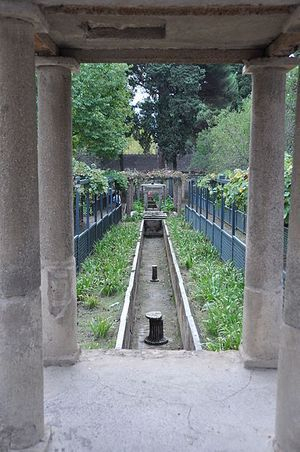 The garden of Octavius Quartio’s Pompeian townhouse displays many of the features usually found in the gardens of Roman country villas. The most striking feature of the House of Octavius Quartio (also known as the house of Loreius Tiburtinus) is its garden. Along with the rest of the house, it was remodelled after the earthquake of 62AD to include features more commonly found in a country villa than a townhouse. The usual peristyle garden does not exist. Instead, a colonnaded viridarium opens out onto a raised terrace, canal, outside dining area and pergolas, overlooking a vast garden plot that extends to the south. This garden is a striking innovation in an urban domus. It also communicate a great deal about the standing and aspirations of the owners. Pompeian atria usually opened onto a tablinium and enclosed peristyle garden. In the house of Octavius Quartio, atrium terminates onto a small, three sided colonnade surrounding a viridarium. This indoor garden in turn opens out onto a long raised terrace running along the building. Shaded and surrounded by entertainment rooms, it was an intermediary zone between the house and the garden proper. Pergolas hung with vines and ivy ran along the length of the terrace and statues lined up along its edge with the garden. It was also crowded with ‘villa’ features, designed to act as focal points and show off the owner’s standing to any invited guests. The overall effect of the garden terrace would have been overwhelming-for all the wrong reasons. It would have appeared cluttered and confusing. Frescos of mythological scenes painted along the walls, were designed to show off the owner’s knowledge. Instead, they display his ignorance as mismatched images of Orpheus and Pyramus and Thisbe standing side by side with Venus Marina, muddling the stories. The Room of Isis and Biclinium. Running east to west down the centre of the garden terrace was a small euripus or water channel. At each end, it terminated at two of the domus’s standalone entertainment rooms: The Room of Isis and the biclinium. The Room of Isis was at the west end of the canal. Decorated in 4th style, its south wall depicts a priest of the cult of Isis-possibly the house’s owner. For this reason, it has been interpreted as a possible household shrine to the Egyptian goddess. The location of the shrine next to the canal emphasizes this as in villa gardens, similar channels acted as symbolic representations of the River Nile. At the east of the canal was an outdoor dining area known as the biclinium, so called because it had two stone coaches set opposite each other under the shade of a pergola. A small stretch of water on which dishes of food would have floated separated the two sets of seats. The room terminated in a raised shrine or nymphaeum. The grand triclinium was the most important of the terrace rooms and designed to make an impact. Decorated in 4th style it was situated at the centre of the terrace at the junction with the garden proper. The room offered diners spectacular views. Their eyes would have been drawn initially to a nymphaeum to Diana which was set at the centre of the terrace canal. Here, a longer, Grand Canal began, running down from the terrace and into the gardens. This large canal ran down the centre of the entire length of the domus’s garden. Running south below the terrace, it was a vast space taking up the rest of the insula. Statues lined its full extent. The canal itself was punctuated in the middle by a further nymphaeum, a fountain and a fish pond or piscine. Archaeologists have been able to identify many of Pompeii’s garden flowers and plants from preserved remains. In the garden of Octavius Quartio, casts of tree roots remained in the petrified soil which indicated plane, cyprus, bay, acanthus and various fruit trees were planted along the canal and the pergola walkways that flanked it. Ornamental flower beds were planted with bay, oleander, narcissi and wildflowers and edged with box and myrtle. The owner of the House of Octavius Quartio clearly wanted to emulate aristocratic villas and had the wealth to do so. However, the statement of social standing falls short because of an imperfect grasp of the cultural and visual language involved. Never the less, he managed to create a garden space that was unique and could not have failed to make an impact. Clarke, JR .The Houses of Roman Italy 100BC-250AD. University of California Press. Capasso, G. Journey to Pompeii . Grant, M. Pompeii and Herculaneum: Cities of Vesuvius.. London: Folio Society.